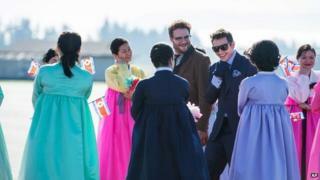 A South Korean activist says he has flown thousands of copies of controversial Sony film The Interview over the North Korean border. Lee Min-bok said he had carried out the launches at night four times since January, most recently on Saturday. The Seth Rogen comedy, about a fictional CIA plot to kill North Korean leader Kim Jong-un, enraged Pyongyang. Sony initially pulled the film after a hacking attack and threats to attack cinemas which were screening it. But it changed its mind and gave the film a limited cinema release after being accused of responding to an attack on free speech. The FBI says North Korea was behind the hack and threats, though it denies this. Mr Lee, a defector from the North, said he had tied the DVDs to balloons along with bundles of US dollars and leaflets criticising Mr Kim's regime. He told AFP news agency: "I launched thousands of copies and about a million leaflets on Saturday, near the western part of the border." He said the launches were all done in remote areas and without publicity but that the police "would have no right to stop me". Mr Lee told CNN, which joined him on Saturday's launch, that he had not laughed at The Interview and found it vulgar. But he said the North "hates this film because it shows Kim Jong-un as a man, not a God" and that he wanted to "tell the truth" to North Koreans. Any North Korean who had access to a DVD player and was found to have watched the film would likely face a lengthy sentence in a prison camp. South Korean activists have repeatedly carried out balloon drops across the border of material which they say shows the reality of life outside the restrictive country, in the hope of encouraging North Koreans to reject propaganda and stand up to their leadership. The North has demanded the South stop such launches, saying they are provocative. Its border guards have in the past tried to shoot down the balloons. But while South Korea says the activity is unhelpful - and potentially places people living near the border in danger - it says its citizens are entitled to distribute their opinions. What is The Interview really like? Why isn't North Korea outraged at these things?